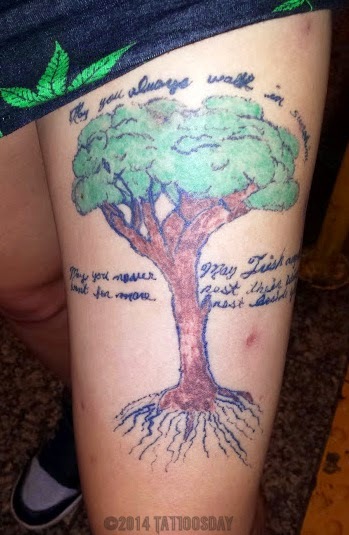 She told me her name was Claire and that she got this Tree of Life tattoo because she has suffered from epilepsy since she was a little girl. "May you always walk in sunshine. May you never want for more. May Irish angels rest their wings right beside your door." She credited the work to an artist named Jackie at a shop in Staten Island, New York. 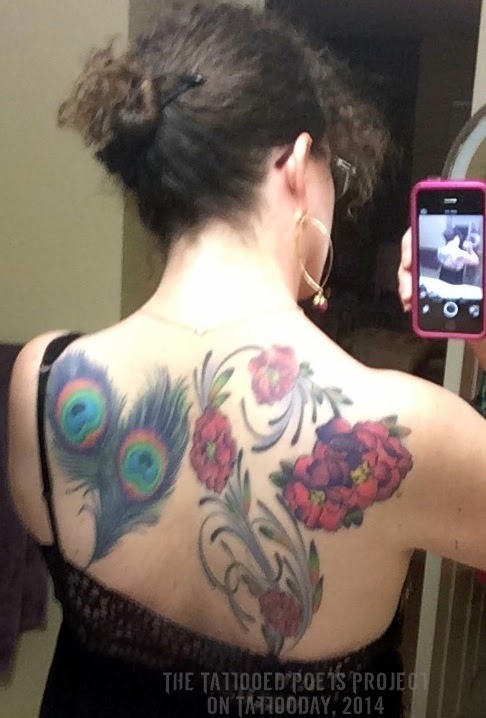 Thanks to Claire for sharing her tattoo with us here on Tattoosday! "...When I was born, my family had three dogs and three cats and this one cat lived till he was 21. So, I had him my whole life, from when I was born to when I was 18 ... he died and I got him tattooed on me ... Basically, I have him with me ... my whole life ... so he lives with me forever." "This is the only animal tattoo I'm going to have, I'm not going to become a walking graveyard of animals. I have a cat now and I flat out said, unless you live to longer than twenty-one, you're not getting a tattoo." Joel doesn't remember where he got Fatcat inked, other than some shop somewhere in Montclair, New Jersey. 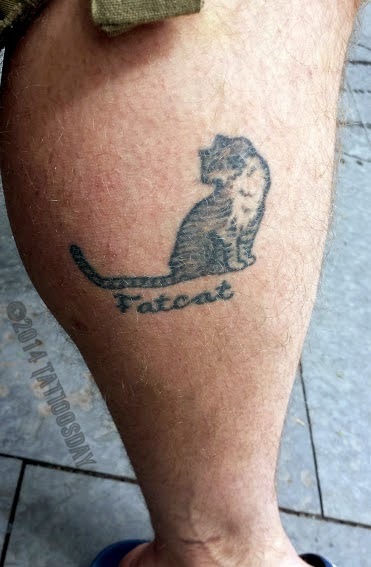 Thanks, Joel, for sharing Fatcat with us here on Tattoosday. Now, he lives on forever on the internet, too! When he shared this with me back at Roseland, I knew I'd be saving it for Memorial Day, especially after Joe explained, ""One of my grandparents was in the Air Force, the other one was in the Navy, so I did the World War II scene with airplanes ... and navy boats - I have battleship and I have an aircraft carrier." What a lucky inkblogger I was to find such amazing work on such a generous contributor! Hannah credits all of her tattoos to Zera Anderson from Brite Idea Tattoo in Ypsilanti, Michigan. 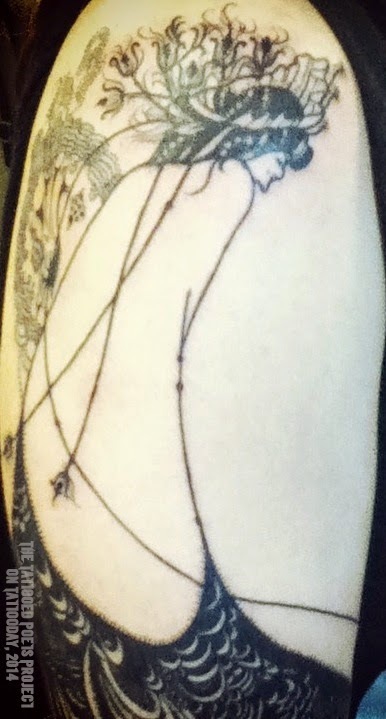 Regarding the tree on her arm, she explained, "I told [Zera] I wanted cherry blossoms and that I really like watercolor-type designs and so she basically just freehand, just did it." She added, "the same with all of them, actually." 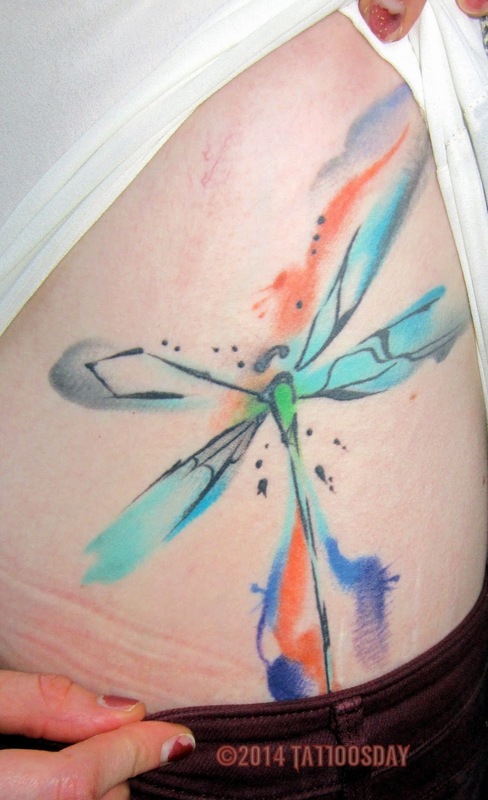 Thanks to Hannah for sharing her wonderful tattoos with us here on Tattoosday! 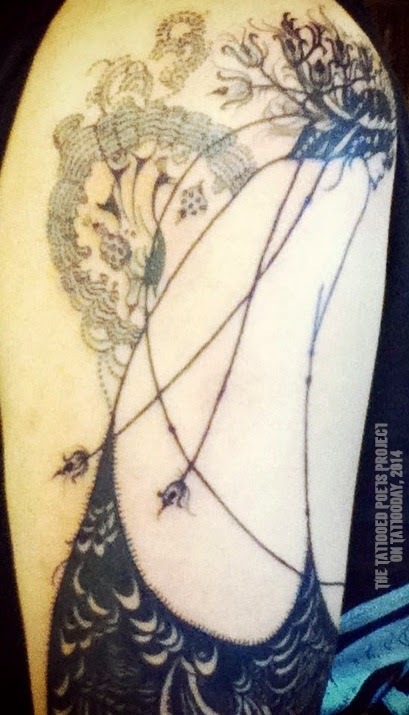 Natalie drew up this design and had it inked by Leo at Torres Tattoos in Brooklyn (at their South Slope location). 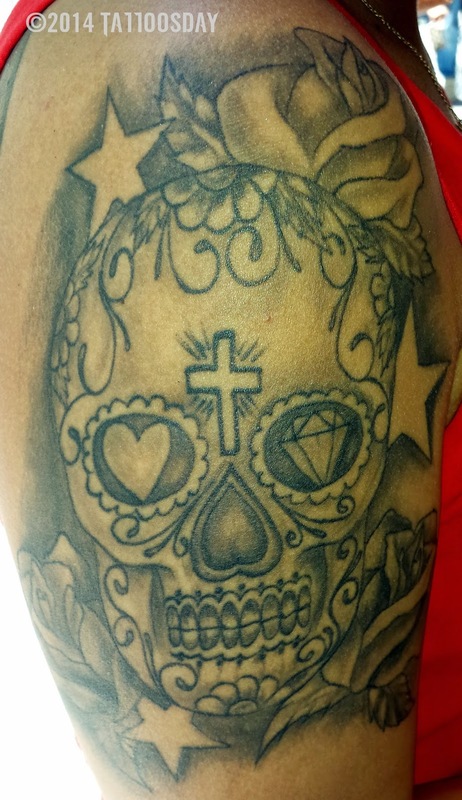 Thanks to Natalie for sharing this cool sugar skull with us here on Tattoosday! 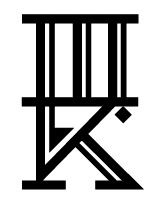 This entry is ©2008, 2014 Tattoosday. 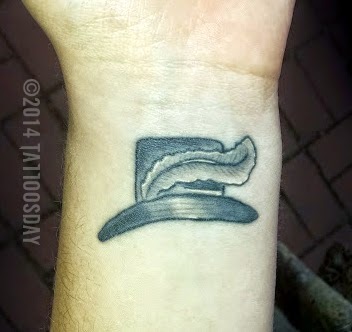 In a new feature here on Tattoosday, we're going to periodically celebrate the ink I find in bars. In addition to the tattoo, I'll talk a little about the establishment as well. We're starting off with a place near and dear to me - Lock Yard in Bay Ridge, Brooklyn. 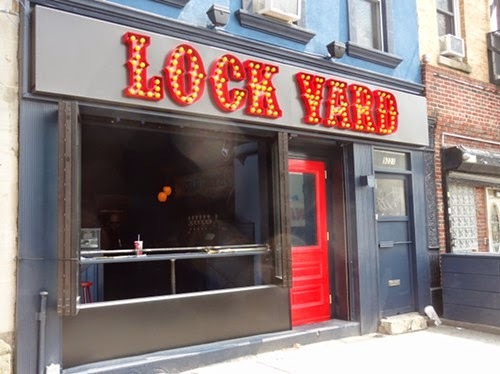 Located in a former locksmith storefront, Lock Yard specializes in artisan sausages and a constantly changing menu of delicious craft beers. It has become a new home away from home, and I moseyed over yesterday for a Sunday brunch brew. 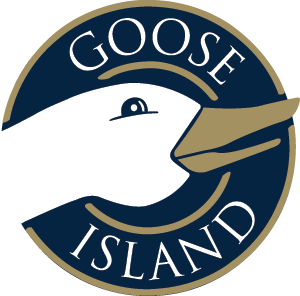 I sat down on a stool and ordered a Goose Island 312 Urban Wheat Ale from Jason behind the bar. 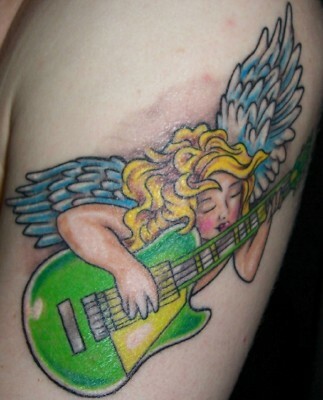 Jason credited this work to Marc Larsen, from Groove Tattoo, also in Bay Ridge. Jason told me he got this work from Marc because he likes skulls a lot. "I just like the way they look," he added, "different types ... different faces ... everything I have on here, he drew on freehand, no stencils involved." Thanks to Jason for sharing his tattoos with us here on Tattoosday, and to the folks over at Lock Yard, for their ongoing hospitality and steady flow of delicious beer! Two weeks ago, I met Harlie in Sheridan Square in the West Village. Harlie credited this piece to Ian at All Star Tattoos in Tacoma, Washington. 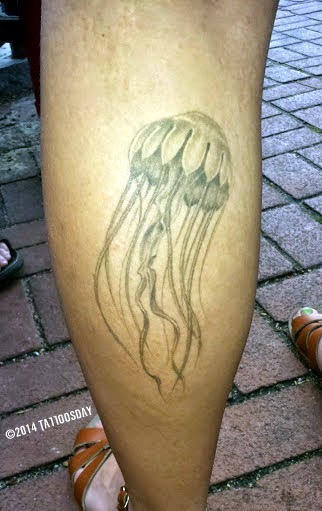 "I brought him a bunch of different types of jellyfish," she explained. She is from Tacoma and elaborated, "I just grew up on a bay that had a lot of jellyfish and it's nostalgic for me and I think they're beautiful creatures." This was also inked at All Star, but by another artist named Ryan. 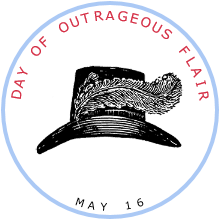 Harlie explained that this design is from a book called The Secret Language of Birthdays and that this symbol represents her birthday, May 16, also known as the "Day of Outrageous Flair." It seemed fitting that I save this post for today, which is Harlie's birthday, the Day of Outrageous Flair. Happy Birthday, Harlie! 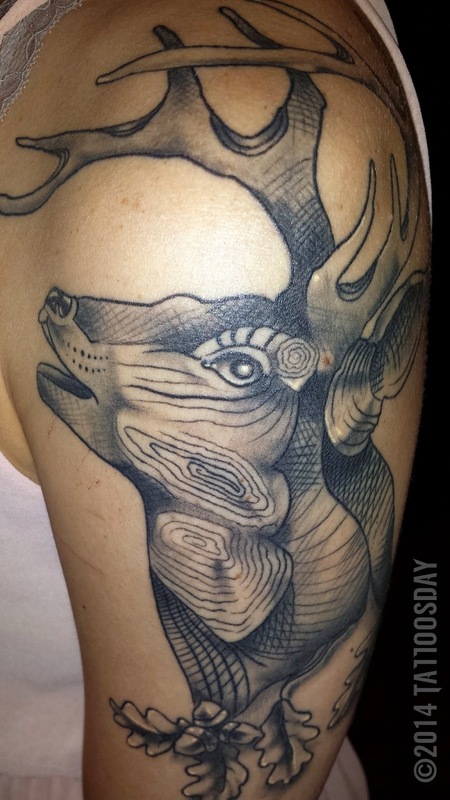 Thanks for sharing your ink with us here on Tattoosday! Ladies, Ladies! 3rd Annual Art Show, Opening Tonight in Brooklyn! Looking for something coo to do tonight in Brooklyn? Head over to the Ladies, Ladies! Art Show 2014 at Eight of Swords Tattoo in Williamsburg. Curated by Miss Elvia and friend of Tattoosday, Magje Serpica, this art show kicks off tonight with an opening party, from 7:00 pm to 11:00 pm. 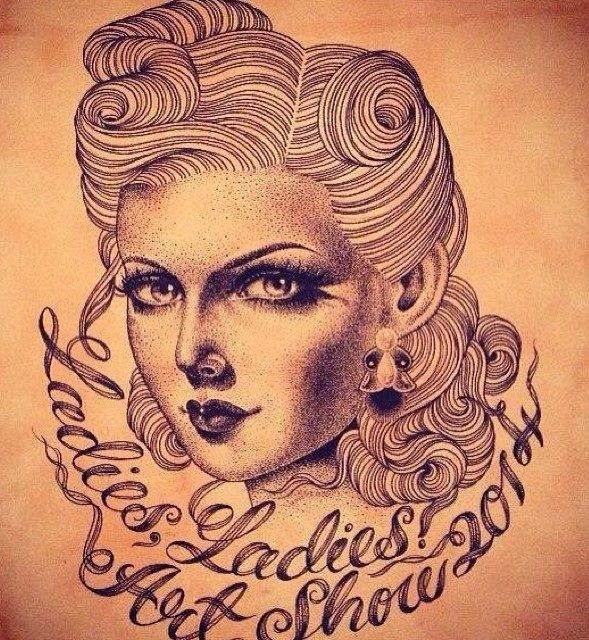 This is the third incarnation of this event that celebrated women tattoo artists and their work. Artists include Rose Hardy, Ashley Love, Kate Hellenbrandt, Kit King, Drew Linden, Karen Glass, Alix Ge, Anna Melo, Mina Aoki, Marie Sena, Alexandra Skarsgård, Debra Yarian, Lara Scotton, Bruna Yonashiro, Gillian Goldstein, Miss Marshall, Lola Garcia, Viola von Hell, Zoe Bean, Dana Melissa Dixon, and many more. The event is sponsored by Pabst Blue Ribbon Beer and Jack From Brooklyn. There will be an after party held at Passenger Bar (S3rd and Roebling). Drink specials all night with the show flyer, so be sure to pick one up before you leave! 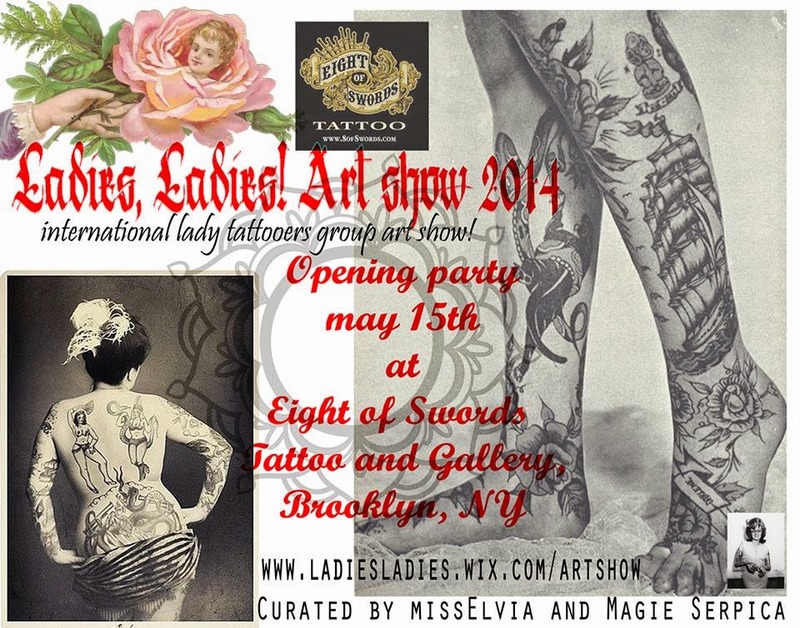 Come one, come all, and celebrate some amazing female tattoo artists! 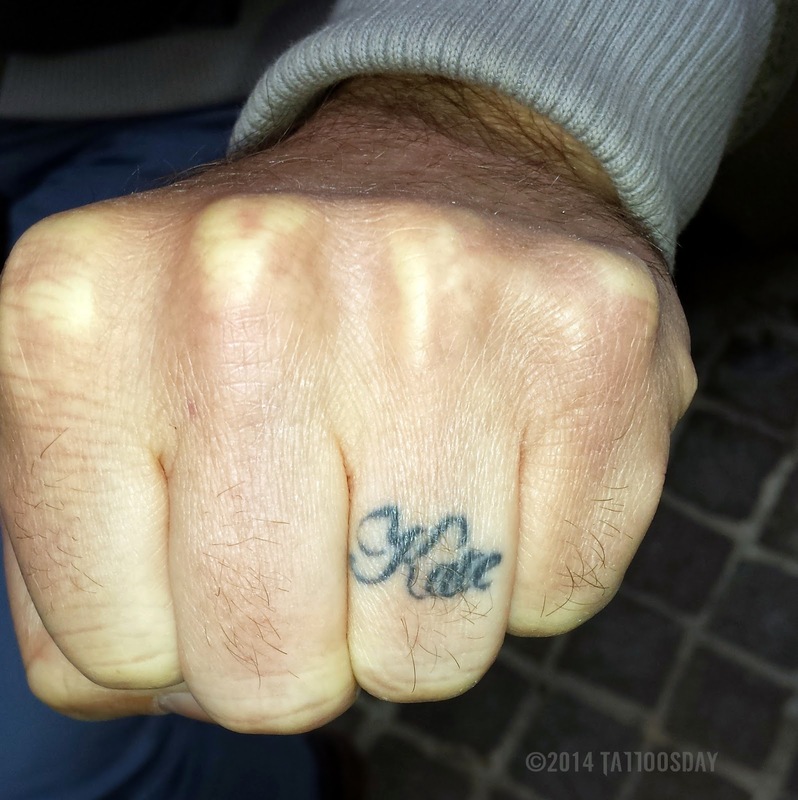 "This is my wife's name, Kate. We've been married ten years and I got it three, four years ago, I think now ... I used to wear a wedding band but I used to do a lot of rock climbing ... so I would take it off a lot, so I just decided to do the tattoo." The artist was his friend Keith Johnson, currently working out of Suicide J.A.C.K. 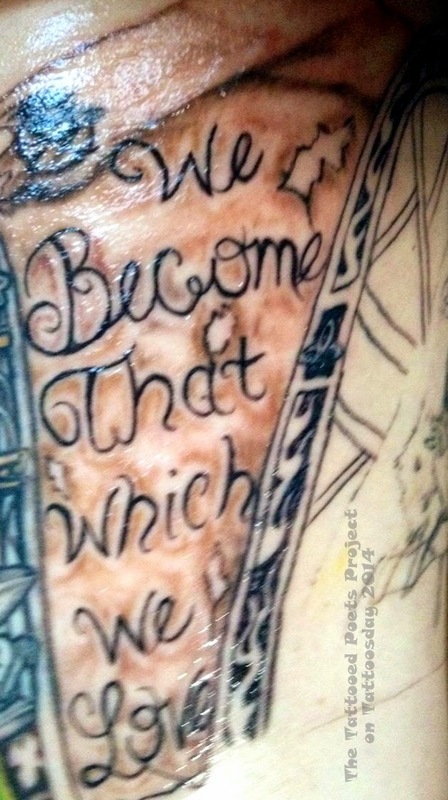 Tattoo in Las Cruces, New Mexico. 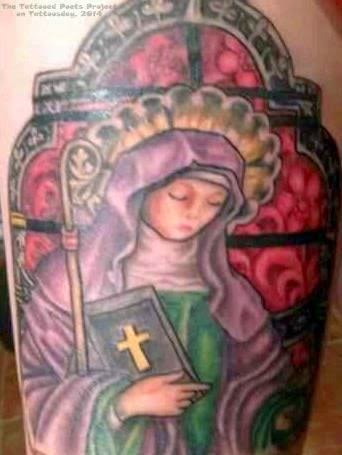 Thanks to Jonce for sharing this cool tattoo with us here on Tattoosday! "My grandfather, in 1950, he shot a deer that was the biggest 8 Point buck that was shot for ten years in New York State ... My family still has the bust of the deer so I took pictures of it and I gave it to my artist ... the branch is for a tree that I used to climb in his back yard ... and there are also tree rings throughout the design." 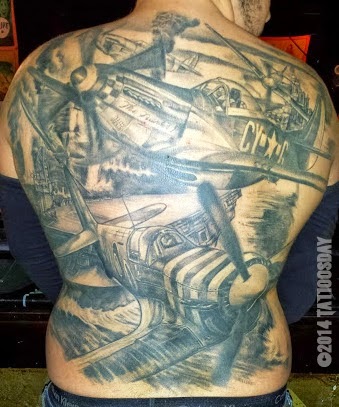 Her artist is Grant Lubbock from Red Baron Ink, on the Lower East Side of New York City. 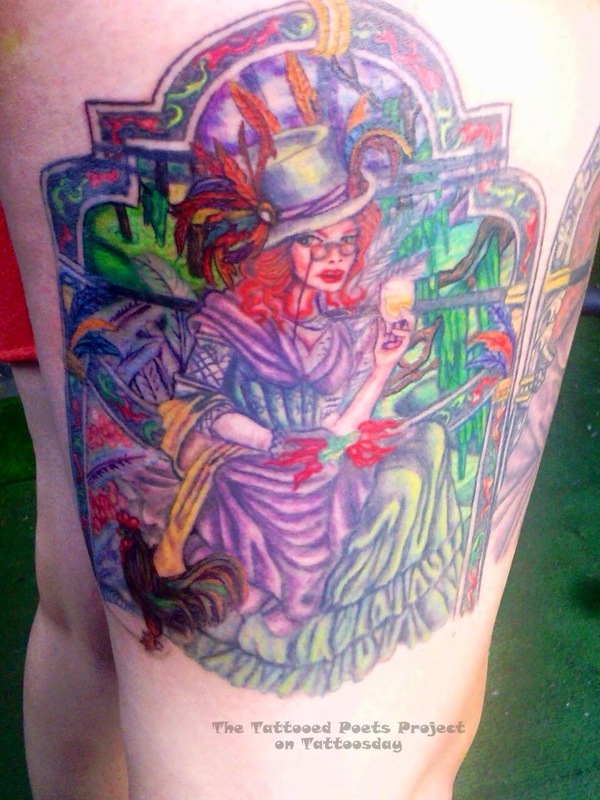 Thanks to Celeste for taking the time to share her cool tattoo with us here on Tattoosday! 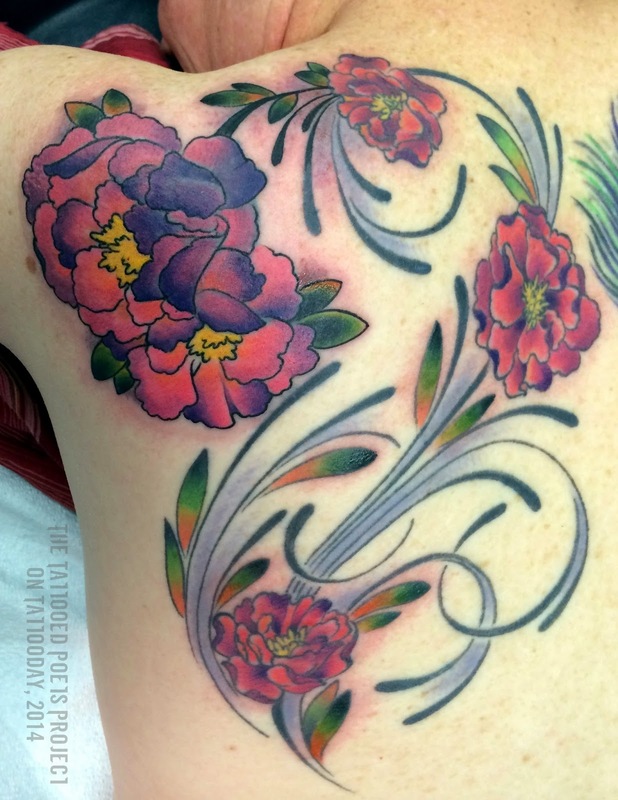 I have now had a few days to decompress after the 6th Annual celebration of tattooed poets on Tattoosday's Tattooed Poets Project. I wanted to take a brief moment to offer up thanks to our record number of contributors and to a few people who helped make this year such an embarrassment of riches. Thanks again to Stacey Harwood and David Lehman from The Best American Poetry blog. 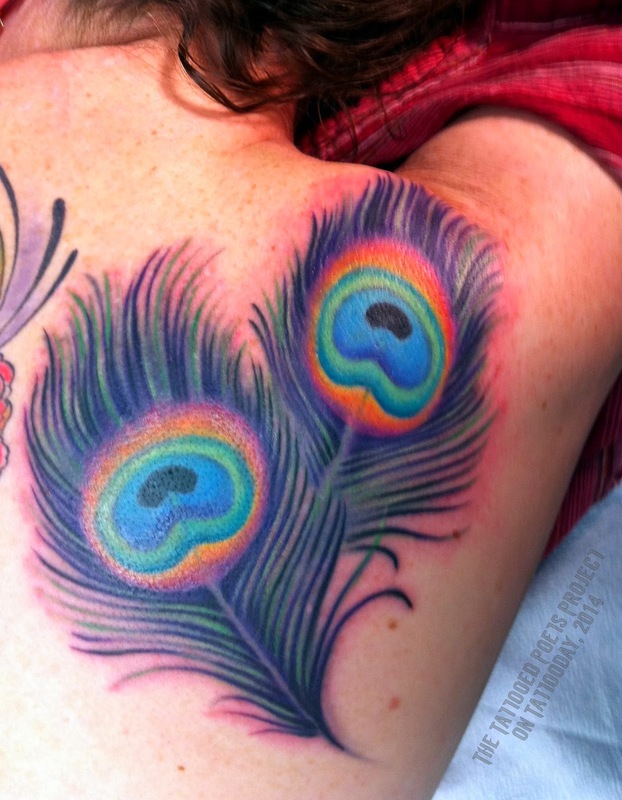 Each year they support Tattoosday by helping solicit contributors and publicize the month. They encouraged me from the beginning, back in 2009, and their continued enthusiasm for Tattoosday means the world to me. Also, I want to thank Tara Betts, a non-inked poet, whose question on Facebook about tattooed poets provided me with a whole squadron of new contributors, six appearing in the past month alone (and many more, in the future I hope). Tara even photographed a handful of her peers at AWP in Seattle this year. Her support has been invaluable. 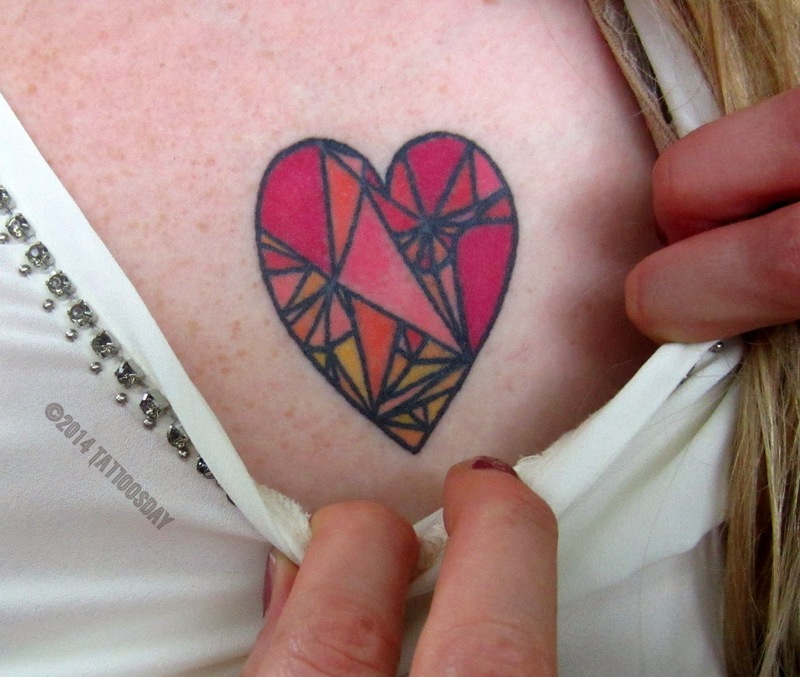 We ended up featuring 54 tattooed poets in April's 30 days, we double-posted on all but 6 days of the month. Believe it or not, at one point there were over a hundred interested poets, so we've clearly not finished celebrating inked wordsmiths. 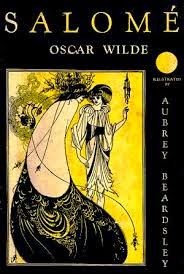 That said, we are going to be handling the overflow with a "tattooed poet o' the week" indefinitely throughout the year. I mean, why should we only celebrate tattoos and poetry in April? Of course, I also want to thank you, the readers, who have offered nothing but kindness and enthusiasm for the work we do here on Tattoosday. 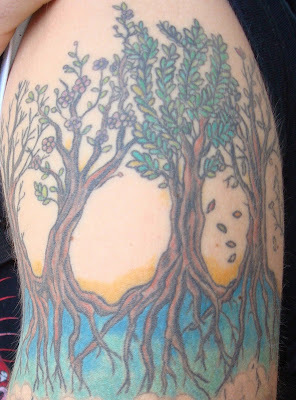 Blogging can be a lonely process, but the Tattooed Poets Project is a community, and I am grateful to not only our contributors, but our readers.